My pain is so deep that it never had a cause, and has no need of a cause. What could its cause have been? Where is that thing so important that it stopped being its cause? Its cause is nothing, and nothing could have stopped being its cause. Why has this pain been born all on its own? The Peruvian Truth and Reconciliation Comission (Comisión de la Verdad y Reconciliatión) began its work at an exceptional moment in Peru’s history. The commission’s work, which was completed and presented to the national governmental body on August 28, 2003, sat in the interval between two decades of internal violence, in which over seventy thousand people died, and the re-imagining of Peruvian political reality after the disastrous authoritarian rule of Alberto Fujimori. The sheer number of dead is noteworthy enough, marking it as the most violent and deadliest two decades in Peru’s history. But the period of internal violence is just as important for the traumatic effect of the violence and the subsequent collapse of Peruvian democracy. Peru’s moment of truth-telling and project of national reconciliation came in the final moment of this collapse, which is part of what makes the commission so exceptional: unlike most occasions for truth and reconciliation, Peru’s transition was not initiated by military or political resolution. Neither of the actors in the conflict—the Peruvian government that slowly, then abruptly, became authoritarian in Fujimori’s famous autogolpe on April 5, 1992, nor the insurgent movement Shining Path (Sendero Luminoso)—emerged as victorious. Instead of victory and defeat or negotiated settlement, the primary actors in the conflict dissolved. Shining Path faded after Abimael Guzmán’s capture, the Movimiento Revolucionario Túpac Amaru (MRTA) failed to gain real footing, and the Fujimori government collapsed under the weight of scandal and corruption. The matter of truth and reconciliation is fundamentally altered by this political vacuum. Unlike other conflicts leading to truth and reconciliation work, Peru, for better or worse, could not operate with an understanding of defeat and victory. Reconciliation could not be posed as a settling of accounts. Both stakeholders, as it were, vanished in Peru’s internal collapse. For the worse, this meant that Peru’s transitional justice questions were inseparable from a genuinely new government whose relation to the violence was minimal. That is, the conflict that defined so much of Peruvian social, political, and cultural life remained unresolved, except insofar as it could not be resolved. For the best, the same thing: a genuinely new transitional government opened up political life in a new and important sense. Without a settlement of hostilities, one can at least begin to conceive the moment of transition as in some sense liberated from lingering resentment, barely suppressed violence, and all of those other ways in which cessation of conflict is barely the end of violence. How could one imagine reconciliation work in this ambiguous political space? Furthermore, and perhaps most importantly, the internal violence of the 1980s and 1990s exhibited a dynamic that without question reached into the founding violence of Peru itself. Consider the nature of the internal violence in the eighties and nineties: Shining Path and the Peruvian armed forces rarely engaged in direct confrontation, opting instead for a displaced violence. Andean and other indigenous communities were terrorized into loyalty by both Shining Path and the national armed forces (for the most part MRTA did not adopt this tactic). This meant that armed struggle and defense consisted mostly of occupying the countryside in order either to put Lima under siege (Shining Path) or assert the authority of the military in hitherto neglected or ignored regions of the Andes (the national military). Though largely engaged in direct acts of terror, both parties also drew on existing local conflicts in order to incite violence. Neighbor turned against neighbor, but always in the interest of a wholly other political vision and hegemony; in retrospect, or even at the time, few if any would say that either Shining Path or the national military had the perspectives and interests of common rural folks in mind. Andean and other indigenous lives were treated as completely dispensable. Mass murder, public executions, and mass displacement became not just one tactic among others but the dominant motif of an internal conflict that did not produce a victor. One could say, then, that this was violence without even the pretension of redemption in either of two senses: a lack of interest in indigenous communities as such by the centers of power or investment by those same communities in the meaning of the exercise of violence and hegemony against them, a result that could never function as a sort of political theodicy. The victims of the internal conflict had no direct interest in the violence, and nothing came of death to compensate for or labor against loss. These communities were victims in perhaps the plainest sense of the word: one who is acted upon and suffers atrocity. This kind of displaced violence enacts, in a barely sublimated fashion, the founding violence of the state of Peru, and indeed the Americas themselves. That is, the tactics adopted by Shining Path and the Peruvian armed forces proceeded with complete indifference to the meaning and significance of indigenous voices and lives. The racism that lay at the root of this indifference and these tactics is part of what it means to say “Peru,” for the very idea of the state begins with the murder and subjugation of indigenous peoples. No matter the distance gained from conquest and colonialism, Peru’s internal conflict repeated, in so many ways, those very same hatreds and forms of profound moral indifference. Joined with the political question, then, is the historical experience of the event: let me ask again, how could one imagine reconciliation work in this ambiguous historical space? For the internal conflict happens in the long shadow cast by conquest’s and colonialism’s system of exclusion and exploitation. One cannot imagine the Peruvian racism at work in Shining Path’s and the national armed forces’ terrifying tactics without this long shadow, without the horizon of racism, marginalization, and violence. What does it mean for a transitional government to pursue transitional justice for an event whose horizon so far exceeds our grasp yet is dependent upon that horizon for constitutive parts of its meaning? In other words, what does it mean to undertake the work of reconciliation in a fully conceptualized and addressed Peru? These sorts of stakes are of course too much for a single commission. At the same time, the aspiration of reconciliation in the Peruvian case cannot gain much distance from those stakes, and it is important to underscore the sincerity with which the commission’s work was undertaken in those many months leading up to submission of the final report. In the interview with Salomón Lerner Febres below, questions of the ethics of reconciliation, the historical experience that bears on the effort, and the intransigent character of political habits and institutions prove crucial for understanding the Peruvian process, its possibilities, and its limitations. Salomón Lerner is the former rector of La Pontificia Universidad Católica del Perú, and he served as the president of Peru’s Truth and Reconciliation Commission from its inception. The commission was composed of several important moral and intellectual figures in Peru, including the social theorists Carlos Iván Degregori Caso and Félix Reátegui Carillo (the two general coordinators), the human rights workers Sofía Macher, Gastón Garatea Yori, and numerous other scholars, lawyers, and activists. Lerner was chosen to head the commission in 2001 by Valentín Paniagua, the president of Peru’s transitional or interim government. Paniagua was elected by the Peruvian Congress to serve as transitional president after Fujimori fled the country in 2000, and he held that position until the election of Alejandro Toledo from the Perú Posible party in July 2001. Lerner delivered the Final Report (Informe final) in late August of 2003 to Toledo in a ceremony at the Palace of Government in Lima. This moment was not without enormous symbolic significance. Not only was the Final Report an attempt to tell the truth about the atrocities committed against poor indigenous communities, which itself is a radical gesture in light of the history of racism in Peru, but the report itself was handed from Lerner to the first president of Quechua origins in Peruvian history. In many ways, one could say that that moment was the pinnacle of the commission’s moral aspiration, seeing in the report and in the moment of democratic rebirth in Peru both accomplishment and promise. As this interview, conducted in 2009, notes, however, the problem of sustaining the project of reconciliation has proven difficult, given the political realities and lack of will in Peru. But the project has also been exceptionally dangerous for Lerner. He has repeatedly been subjected to death threats, which is no doubt a consequence of the truth-telling project in the Final Report he helped compose (the report names perpetrators and details atrocities), as well as the fact that the commission refused to make amnesty part of reconciliation. Lerner and his colleagues insisted on the judicial significance of the report; while the commission held no prosecutorial power, it was important to provide information and interpretations that would facilitate the legal pursuit of those who had committed crimes against humanity. The Final Report begins with affects of shame and dishonor. Shame and dishonor are important affective states, for both underscore a case of moral failure in which things could have been different, but, through a combination of indifference and hate, mass murder and terror continued without objection or troubling questions. In his presentation of the Final Report to President Toledo and on numerous other public occasions, Lerner has insisted on this feature of Peru’s period of internal violence: everything could have been different. The content of the Final Report makes this case without much ambiguity. The report comprises nine volumes and a dozen appendices, detailing the persistence of violence and the consistency of its character and sense of impunity. The aesthetic composition is itself something to contemplate. Alongside the forensic research, timelines, reconstruction of violent events, extrajudicial killings, and political interpretations of actors and events (which bring the institutional character of the violence into focus), we find lists of perpetrators, victims, and testimonies. In the CD version of the Final Report, the commissioners includeYuyanapaq (Quechua, “to remember”), a digitized version of the photographic exhibit that traveled across Peru, documenting not only names of actors and victims but also the faces and landscapes of terrifying violence, expressions of mourning, and thus a visual reminder of the meaning of loss. This sense of heightened visibility of suffering, as noted, is already a kind of act of reconciliation. And in that sense it is important to take note of the place of the commission in relation to the Peruvian government and civil society. While the commission held no prosecutorial power or authority to initiate the work of reparation, it did function, indisputably, as part of Peru’s new government. That place in the social order marks its work with an important authority and fuses the exhortations to shame, dishonor, and prostration to the political body. It was not just a case of human rights workers or international observers making suffering visible. It was the state itself. At the same time, as Lerner notes in the final remarks of this interview, the commission and the findings of the Final Report are by themselves incapable of initiating the sort of overturning of political establishments, habits, and institutions necessary to radically renew (that is, begin again) Peruvian democracy. And yet one has to appreciate the importance of making suffering visible in a context in which so many deaths and so much suffering have been intractably invisible for so many centuries. Even as reconciliation work in Peru fails to decisively transform political establishments (is it fair that we ask so much of a report? ), the moral injunction of the Final Report is not nothing and, as part of official state history, serves as a persistent and insistent reminder that while it is often difficult to believe that another world is possible, the violence and atrocities of this world we know are not always undertaken with impunity and received with indifference. Perhaps in that very little way, but not nothing, reconciliation work carves out a meaningful place in the world. John Drabinski: You were trained as a philosopher, having studied at the Catholic University of Louvain, writing on Nietzsche, Heidegger, and others, and you served as rector of the Pontifical Catholic University of Peru from 1994 to 2004. How were you chosen to head the Peruvian Truth and Reconciliation Commission? And how did your training as a philosopher guide your work on the commission? Salomón Lerner Febres: The Peruvian Truth and Reconciliation Commission was created during the last transition to democracy in Peru, after a decade of authoritarian rule by Alberto Fujimori (1990–2000). Since 1980, Peru had been experiencing a process of mass violence, which was begun by a Maoist guerrilla organization widely known as the Shining Path. From the beginning of its so-called people’s war, the Shining Path put in practice ruthless and terrorist methods. It was fought back against by the state security forces. Unfortunately, the civilian governments were never interested in devising a lawful strategy for dealing with the very real terrorist threat. As a result, both the guerrilla and the state engaged in massive human rights abuses. During the 1980s and the 1990s, the victims of those abuses—mainly impoverished indigenous peasants from the highlands—did not have any chance of getting justice. Not even a public recognition of the terrifying ordeal they were going through. Thus the context of transition was understood by the incoming democratic forces as an opportunity to create a public exposure of the abuses of the past two decades. The creation of a truth commission was seen as an important way of tackling that problem.d Twelve citizens were appointed members of the Truth Commission and were chosen by the Peruvian provisional government in 2001. The commission was assigned to act in an eight-month period. They were not chosen as representatives or delegates of any particular sector of society. They were elected on the grounds of their social standing as well-respected citizens, intellectuals, or as persons already involved in the defense of human rights. I was invited to head the commission on those same personal grounds. However, it might be unwise to dissociate this choosing from the fact that at the time I was rector of the Pontifical Catholic University of Peru, which is the leading university in the country and which, during the authoritarian period, had been a salient voice speaking up to defend the rule of law and the respect of human rights.d My professional formation as a philosopher was very important for my own understanding of the kind of mission that had been assigned to the commission and to myself as its president. 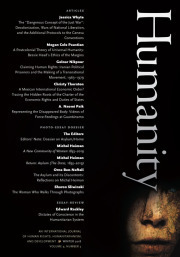 Although I had not been previously directly involved in human rights promotion or advocacy, I found in my personal intellectual training the conceptual resources to understand that truth-seeking was not only related to making denunciations and making possible the work of justice; it also had to do with a broad moral examination of our own society and with the necessity of crafting a message about the values of human life and dignity, of tolerance and respect, as a means for giving the new democracy a chance to consolidate itself. A philosophical approach to truth allowed me to think of our mission in terms of a general, transcendent idea of justice: justice as the historical context in which human life could be dignified in Peru. JD: There of course have been many truth commissions, but only some have added reconciliation to a commission’s work. The addition of reconciliation opens a whole new dimension to a commission’s work, moving from the reconstruction and reportage of events to the difficult work of confronting the state, communities, and victims. Why was reconciliation an important element of the Peruvian process and transition? What has reconciliation added to the task of telling truths in the commission’s report? SLF: Actually, the presence of the term “reconciliation” in the Peruvian commission’s name is not the result of a conceptual or ethical elaboration and decision, but the outcome of the political hesitations of the new government elected in 2001.d The transitional administration lasted for only eight months, during which elections were held. The newly elected government inherited the commission, which had been previously created bearing the name of Truth Commission. The new president [Alejandro Toledo] decided to ratify the existence of this investigative body with two minor modifications: the addition of five new members to the seven that had been originally appointed, and the renaming of the commission as Truth and Reconciliation Commission. As I have mentioned, the adding of the term “reconciliation” was not the manifestation of a particular ethically driven commitment to truth; it instead had the symbolic function of cutting the teeth of truth-seeking for the benefit of those sectors of the state and of the political establishment that could have felt uncomfortable with truth. To add “reconciliation” was a way of saying that truth was not to be exposed in order to call to task the offenders, but in order to achieve an abstract, nondamaging settlement of past grievances.d Thus the term “reconciliation” was a potential threat to the mission of the Truth and Reconciliation Commission. Independent of the outright intentions of the government, it was well known that in the Latin American tradition “reconciliation” was a euphemism for amnesties, institutional oblivion, and impunity. So it was necessary for the commission to make an interpretation of “reconciliation” that would not leave any room for impunity.d The commission was centered on truth-seeking, dignifying the victims, producing materials that would make justice feasible, and elaborating a comprehensive historical and moral interpretation of the process. Reconciliation was seen as a by-product of truth and justice, and, in any case, a social outcome that could not be produced by any single organization.d Truth-telling is a moral and methodological problem: it is related to recognition and moral reparation for the victims and to producing objective pieces of evidence for the functioning of justice (by which I mean trials and reparations). Truth cannot be interfered with by teleological considerations such as the idea of reconciliation. Reconciliation, as a highly desirable end, would be the result of the state’s living up to the obligations and moral lessons that would be derived from truth. For that purpose, the main necessity of truth-telling is to be ethically conceived. This means truth is to be centered on the dignity of human life and on the right of the aggrieved and excluded ones to be respectfully heard and to be fully recognized as human beings and as citizens as well. JD: How does the vision of truth and reconciliation in the Peruvian commission differ from other high-profile efforts of truth-telling and reconciliation? In particular, one of course thinks of the most famous case of South Africa, but I wonder about the relation of the Peruvian process to other Latin American commissions. What does the Peruvian case share in common with other commissions? And how does the refusal of amnesty mark the case of Peru as different? SLF: The Peruvian Truth and Reconciliation Commission shares some traits of previous high-profile commissions, mainly the historical scope of its research. We were inspired by the efforts made by the Guatemalan truth commission, whose aim helped us to explain violence by taking into account the relations of violence to culture and the historical background of a particular given society. We found this kind of approach also in the South African Truth and Reconciliation Commission.d Gradually, truth commissions have been developing an ever more complex understanding of truth-telling, a conception in which the necessities of legal justice and of historical interpretation are mixed together. In this respect, the Peruvian commission’s approach to truth-telling did not significantly differ from what is assumed in this growing consensus. Existing differences arise mainly from the different approaches to justice, which the commissions do not “invent” by themselves but are oriented by their respective legal mandates. The South African commission had a legal mandate to make amnesties possible as a result of an honest confession by perpetrators. That aspect of its mandate is clearly different from the one received by the Peruvian commission. We were not asked to open up any kind of way out for perpetrators. This meant that, even if the Peruvian commission did not have any judicial attribution, it had to produce a truth that could be useful for future judicial prosecution. JD: The Final Report begins with a moving moral image: a nation lying prostrate before the victims. Along with that image, the opening paragraph invokes shame and dishonor as the moral markers of the Peruvian state during the eighties and nineties. How does that image and how do those moral terms reflect the commission’s understanding of reconciliation? SLF: The members of the Truth Commission were convinced that reconciliation should not be understood, in the terms of the commission’s work, on interpersonal grounds but as a public outcome: the reformation of Peruvian institutions and of the Peruvian cultural framework; the abandonment of racism as a major feature of Peruvian everyday life and of the exclusion imposed by the state on its indigenous and impoverished population. For us, reconciliation—as a goal achievable through truth-telling—was a matter of deep, broad, morally driven institutional reform. We were also convinced that the starting point of that reform should be an ample, sincere, and unqualified act of recognition from the state and the privileged classes to the victims. The most salient example of that recognition would be, in turn, what we called a respectful hearing of their plights.d The notion of a nation lying prostrate before the victims is closely related to that notion of reconciliation. We meant to be the first, though not the sole, representatives of the state making that gesture of recognition. The Truth Commission, through its Final Report, would be the starting point for a new kind of relation between the Peruvian state and its excluded citizens. JD: How did the commission understand the difference between forgiveness and reconciliation? Was the difference between forgiveness and reconciliation difficult to maintain when the commission began concrete work in affected communities? Or was the difference between the personal and the social sufficient to maintain this boundary? SLF: The Truth and Reconciliation Commission never assumed an approach to reconciliation as an interpersonal experience whereby victims and perpetrators get together to overcome past differences, conflicts, and grievances. For the commission, it was evident that such intersubjective reconciliation could only be expected to happen in the long run, and never as the result of a vertical or institutional decision. Nobody, not even a truth commission, is entitled to ask the persons involved to reconcile and least of all to forgive. Therefore, the delicate dynamics of repentance and forgiveness were not present in the work done by the Truth Commission. Our efforts were aimed at exposing the truth and at pointing out what kind of transformations public life in Peru should undergo in order to have a more peaceful society. In the realization of this form of reconciliation, forgiveness is not a necessary element. JD: Why were the audiencias públicas—those public events at which victims, family members, and community leaders spoke openly about atrocities committed against them—so important for the commission’s work? SLF: They were very important on two accounts. First of all, we understood our mission as a dignifying one. We thought that a major symbolic change in Peru could be achieved if a state body—such as the Truth Commission was—would invest its best efforts in giving voice to the voiceless. For the commission, the first act of reparation was the existence of the commission itself and specifically the widespread activity of testimony-taking that we developed. The public hearings were a continuation and a social performance of that testimony-taking. To hear the voice of the victims in an official setting—and to hear them in a respectful, nonconfrontational fashion—would be a form of broadening the scope of public utterance in Peru.d In the second place, public hearings were necessary as a means for breaking the thick layer of indifference that still affects Peruvian society. The commission wanted the urban, middle-class, privileged population to become sensitized toward the unspeakable suffering of their fellow citizens, to have a sense of what had been happening in the highlands. We also wanted this sector of society to understand that peace does not actually exist as long as the abused ones do not receive a reasonable degree of justice. JD: In Pamela Yates’s documentary film State of Fear, there is a famous scene in which an elderly Quechua man stands up in one of the audiencias públicas and declares, upon delivering his testimony, “Today I am Peruvian for the first time.” Does this declaration indicate something about the meaning of truth-telling? With Peru’s long history, from conquest to colonialism to modern racism, could one say that simply telling the truth about violence in the Andes is its own form of reconciliation? SLF: Yes. This is exactly what I have been trying to explain in the preceding answers. The historical scope of our investigation made it possible for us to produce evidence that supports the characterization of Peru as a fractured society in which large swaths of population are excluded even from “Peruvian-ness.” In this regard, truth-telling is certainly a contribution to reconciliation, but not in an interpersonal dimension. Truth-telling rather contributes to a process of public reconciliation that calls for justice and respect, leaving the decision of forgiveness and repentance to the inner feelings of every individual. JD: The Peruvian case is exceptional in many regards. In particular, reconciliation had a difficult beginning. No party or power emerged victorious out of the internal violence of the 1980s and 1990s. Rather, the state collapsed and a new government was formed. Typically, reconciliation requires a victim and a perpetrator, as well as a loser and victor in conflict. How did these circumstances affect, if at all, the meaning of reconciliation in the Peruvian context? SLF: Again, I would say that this kind of reconciliation was not an issue during the Truth Commission’s work. The Truth Commission made a translation of the notion of reconciliation from its interpersonal dimension to a public one. For the commission, the process of reconciliation is identified with the relations between state and society and with a historical, unachieved task of Peru as a republic: the constitution of a society composed of full citizens.d For this purpose, the problem of victors and losers is not important. To some extent, it is possible to say that neither the Shining Path nor the state was the loser. As always, the losers during this process were the most excluded and impoverished sectors of society, who were victimized both by the Shining Path and the state security forces. JD: The Final Report also begins with a reference to renewing democracy in Peru. What idea of democracy guides the commission’s work and vision? And why was it important to link the work of the commission to the idea and practice of democracy? SLF: Peruvian society has experienced many transitions to democracy, which means at the same time that it has failed many times to achieve that goal. For the Truth Commission, the major reason for the repeated failures of democracy in Peru has been the pretension of building it while excluding a great portion of its population from the experience of citizenship. A democracy without citizens is not only unsustainable; it is not even a democracy. For the Truth and Reconciliation Commission, a democracy is a political regime in which, at the institutional level, the rule of law prevails, and where, at the subjective level, an experience of integration, inclusion, recognition, and respect is available to everyone.d For the commission, the investigation of violence and human rights abuses was a very painful experience for Peruvian society, but it could also be a creative moment: to look at ourselves should have been an experience of learning. And the major lesson to be learnt there was that Peruvian democracy would always suffer extreme weakness as long as a large part of Peruvians, such as the victims, were not citizens. JD: How has the political reality of Peru been affected by the commission work? In particular, I wonder how much, if at all, the far left and far right have been affected by the commission’s findings? Does the commission hope to change Peru’s present political reality or onlyto document the violence and crimes of the past? SLF: The Peruvian political establishment chose very early to ignore the lessons derived from truth-telling in our society. The Truth and Reconciliation Commission has been generally disregarded, although some lukewarm attempts at fulfilling its recommendations (mainly reparations) have been made. The state has chosen to ignore the remaining problems of exclusion. And the language of intolerance and authoritarianism, of racism and exclusion, is still present in the everyday discourse of Peruvian politicians. A case in point: a few years ago, a conservative politician, acting as president of Congress, referred to Andean population as “llamas and alpacas.” After that he was appointed as Peruvian ambassador to the Organization of American States, and still after that he was appointed as secretary of defense by the current administration.d Therefore, it is safe to say that Peruvian political reality has barely been affected by the Truth and Reconciliation Commission’s work, and there is little hope for witnessing any important transformations in the near future. The main explanation for this gloomy perspective is the breakdown of the Peruvian political system, mainly its party system, which has affected the possibilities of accountability, of serious political debate, and even the existence of public discourse in Peru. 1. Comisión de la Verdad y Reconciliación, Informe final, vol. 1 (Lima: Biblioteca Nacional del Perú, 2003), 29. Associate professor of black studies at Amherst College. He is the author of over three dozen articles and three books, including most recently Levinas and the Postcolonial: Race, Nation, Other (Edinburgh, 2011). He is currently at work on two book-length projects, one on Édouard Glissant’s poetics, another on James Baldwin and the history of black Atlantic theory.